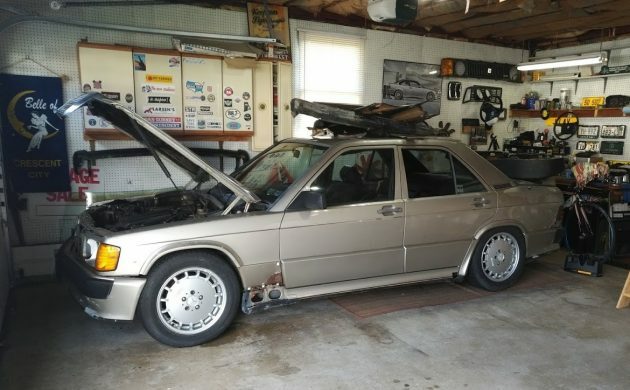 Jeff Bought A Junkyard Cosworth-Mercedes 190E 2.3-16! As some of you may have seen, I’ve been hinting that I wanted to find a new project car with four doors. 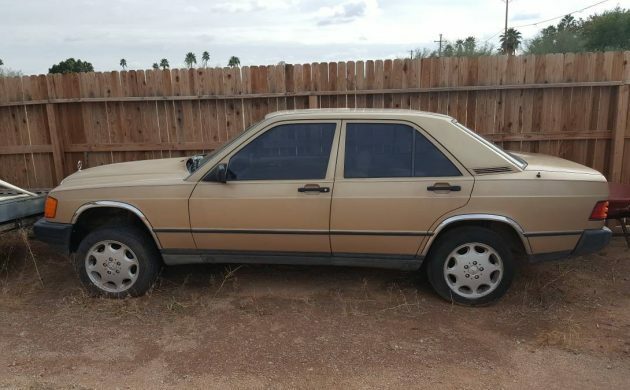 I settled on a 1986 Mercedes-Benz 190E 2.3-16 as the ideal target, but buying one would mean selling off my prized ’87 BMW 325is. 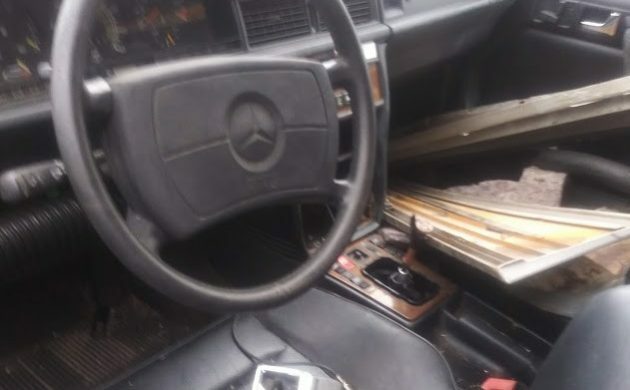 Seeing as I’m bad at letting go of things, I took a different path – and found a genuine Mercedes-Benz 190E Cosworth in a Pennsylvania junkyard for under $1,000. It’s now home in my garage, and I’m going to be providing ongoing updates here on Barn Finds as this junkyard-find 190E 2.3-16 gets nursed back to good health. In a moment of boredom on a recent Saturday while my infant daughter slept, I perused car-part.com to see if any yards had 2.3-16-specific parts in their inventory. Even if I couldn’t afford a proper Cosworth, maybe I could find some parts to sell. Instead, I found this: a 1986 model wearing Smoke Silver paint, sitting on its belly in a junkyard in Douglassville, Pennsylvania. I couldn’t believe it when they sent pictures showing the complete car, with its 2.3L inline-four with a Cosworth-designed head still in place. Even better, it was a desirable manual transmission example with the unique close-ratio dogleg-shift box. I went back and forth with the yard several times, as is often the case with salvage facilities. Truth be told, they were genuinely nice people, even if some items weren’t as accurately reported as I had hoped. But the car was all there: the engine, transmission, limited-slip rear end, Recaro interior and (most) of the 2.3-16-specific bodykit. 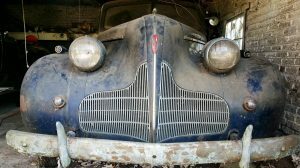 There was also a good deal of rust, mostly contained to the taillight panel, but also in the floor beneath the passenger-side backseat; along three of the four jack points; the bottom of the driver’s fender; and beneath the trunk on the right and left side. But it could have been so much worse. Seeing the engine there with a valve cover that wasn’t missing all of its paint gave me some hope. 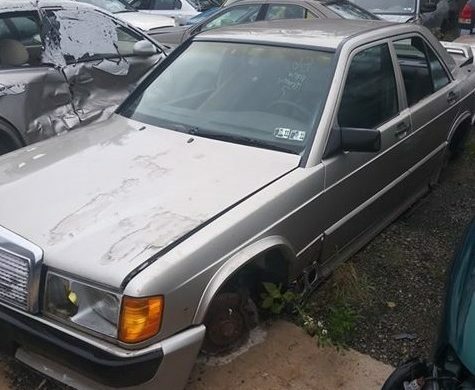 The CarFax further filled me with confidence, as it showed this limited-production 190E was dealer-serviced at Mercedes-Benz of West Chester, PA up until 2011. It was a two-owner car with a clean title (missing, of course) and the only parts the yard had sold off of it were the radiator and rear window regulators. Of course, this meant the rear windows were smashed out, and as yards often do, they cut the exhaust and the cat off the car and yanked the gas tank. The problem with that last part? The 16V’s had a larger gas tank from the factory, and replacements are near obsolete. After I took a deep breath, the deal was done. I found a shipper on U-Ship and had the 190E home a few days later. I bought a set of 16″ R129 wheels from another junkyard in Long Island and sent those out to PA so the car would roll. It’s going to be a very long road to bring this car back, but for a rare example like a 190E 2.3-16 with all of its unique components attached, it was a chance worth taking. 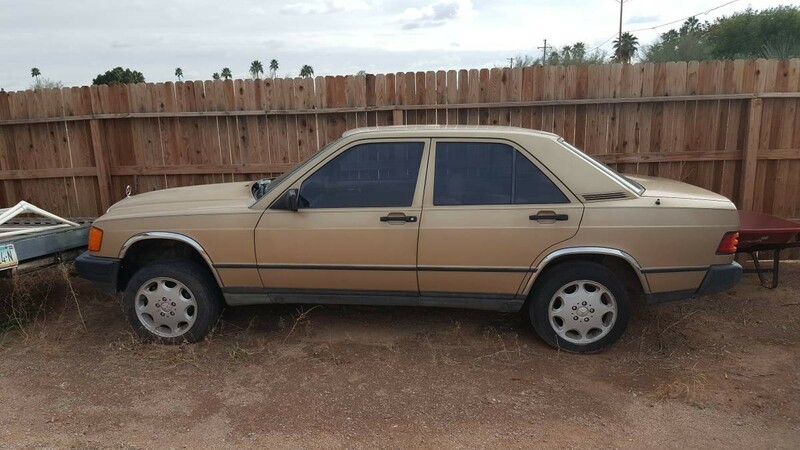 Hopefully, we’ll find out if the engine still turns (the yard claimed it was running/driving when it came in) and we can get this significant Mercedes-Benz back in action and properly saved from a junkyard. I’ll be posting updates here on Barn Finds and here on Instagram as well. Be sure to stay tuned for more videos of the process too, so be sure to subscribe on YouTube. Very cool, you must have some time on your hands! Awesome that you got it home! Best of luck Jeff, sounds like you know what you are up against. It will be interesting to follow your progress. Take care, Mike. Absolute bargain Jeff. I’m envious and super stoked for you! Absolutely agree. Always sweet to get in low and spend the money as you go along. At least thats my way. Seems to be less painful! A little bit of self deception goes along way. Good luck and go nuts! The mechanical fuel injection contraption alone costs more than $1000 – and you’ll have a BLAST working on it! Engine bay looks good. Awesome find. Wonderful, always wanted one of these. 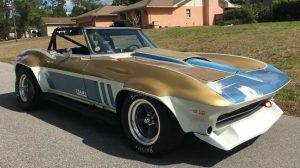 Saw a comment about this car and have been looking forward to seeing your find. This is really cool! And not that bad for a wrecking yard find. Can’t wait to see you revive it. Great find! I never have luck like this. Whenever I see something worth my time at the yards around here they are picked clean. This one looks sweet. The rust will be a pain but so worth it if you can get it back up and running without too much trouble. All the best with the restoration Jeff. Great car when it’s finished. Thanks Ken! I agree it will be sweet when complete! good luck with your project Jeff! Hi Jeff. Where do you get a replacement tank? Just put a standard 190 gas tank in. Only the purist of the purists will notice. Leaning that way…but may have two solid leads on the correct unit. It’s early. :-D But getting upset gets me no where, so cooler heads always win. Euro-trashed. The rust sounds scary, but at that price, you can’t go wrong if you have to part it out. I do not know if it is a federal thing or just a PA state thing but here in PA salvage yards are required to remove the gas tank and drain all the fluids out of a car before it can be placed in the yard to sell parts off it. 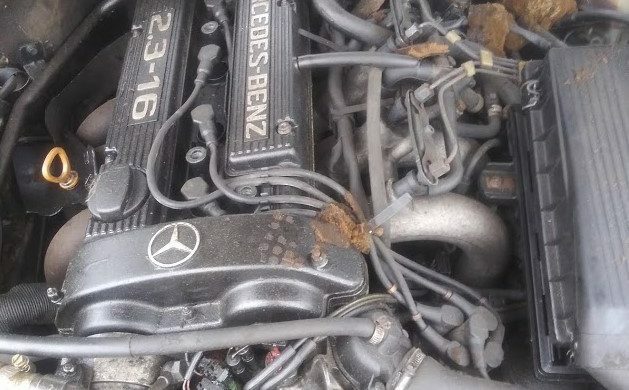 So be sure to check ALL the fluids in the car before you try to start it and move it under its own power. Cathouse – the website for the yard I go to near Myerstown states that for safety they “will remove gas tanks and windshields.” Never really took notice as I’ve never needed a tank & a fuel pump is one of the things I won’t go salvage with since it’s zero fun to drop the tank & to have one go south a week later would really be the turd in the punchbowl… however, I always interpreted that as if you needed the tank removed for whatever reason then they would be the ones to do it. Due for a visit soon so I’ll have to have a look. Myerstown, Lebanon County, that is not too far from me. I used to go to a local yard that had some old stuff still in it. I was friends with the owners. It was the owner who told me that he was required to remove the gas tanks and drain fluids before a car could be put into the yard area. I just do not recall who he said it was that required it. Maybe federal, maybe state, might even have been the locals. CATHOUSE – yeah, pretty sure the car is drained. Will replace / refresh all fluids, including diff, before first start-up. As a southern boy, that rust would scare the hell out of me, especially that at the jack points. The old rule of rust–you only see 10%. Come down here to Texas and buy a parts car. Then, either transfer all the Cosworth bits to the new body or cut replacement pieces and weld them in. Great find and good luck with your project!!!! Drove one of these once and always have wanted to own one also!!!! I got a little annoyed that the title is missing. In my experience, junk yards and scrap yards won’t take a car without a title. It has been since the 80s that I have sold to them. A nice find though. Looking forward to updates. Hey Paul – they DID have title, but they claimed they cannot find it. Not entirely surprising considering they had the car for many years. Still clean based on CarFax / Autocheck. I guess that it is a good thing that someone from the state did not stop by the yard to do a spot check. PA salvage yards are required to have the title on hand for every vehicle in the yard. Maybe that is why they were willing to sell it cheap, to get a problem child off their property. CATHOUSE, it’s an intriguing thought. Might have been a win-win for everyone. Jeff, you are lucky you bought the car where you did. In California, if I remember correctly, every salvage yard is required to surrender the title when they purchase the car and pronounce it junk. It takes a miracle to get a salvage yard car back on the road. I think a petrol tank will turn up on eBay soon enough. Very few people will want one as it’s generally not something that needs changing. Anyone breaking one should let it go cheap or it will end up being scrapped. Great find! One of my bucket list cars. After owning a few German cars, including an S4, there’s nothing quite like a German special performance model. 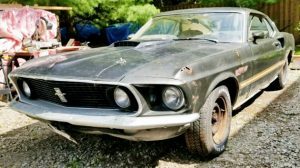 They do get pricey to restore, I’m sure, but the enjoyment you will get will make it worth the tie, effort and $$. Definitely keep us interested members updated! Thanks Jeff for saving this factory homologation car. In 1986 one of these was assigned to me as a MBNA company car. May have been the only manual transmission in the corp. fleet. I refused to turn it in, bought it, drove it for 415,000 miles over the next sixteen years. If you carry a spare clutch slave cylinder- the car is very reliable. Wow, Steve – that’s impressive mileage! With just 130K on the clock, I hopefully can catch up to you someday! Good Luck, have fun, Jeff. Good luck with it Jeff, I wish you all the very best. I love your eclectic taste in cars as well! Cool. Nothing like a back from the brink underdog story to fire the ol’ imagination. As often said on this post ‘Great Find’. Been looking for one for years. If I ever find one my 91′ BMW’S a 318is & 325is will still find a home in my garage along with my 96′ 328is. 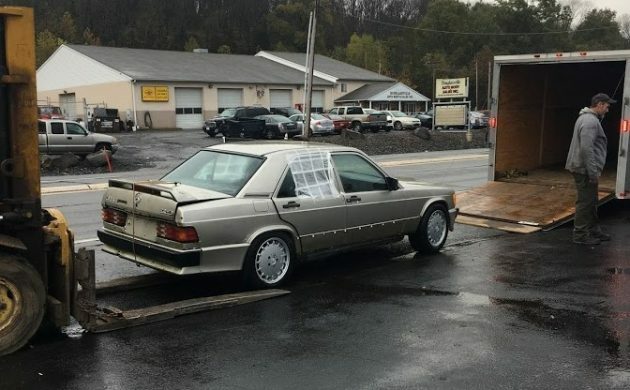 Back when these cars were new but not yet well known, a physician friend of mine allowed his college aged son to do the paper work,ordering a 190 to go along with the family S class. Dad was totally surprised when the car came in and it was a Cosworth 2.3-16 with a manual. After a bit of a fuss, he went along with it. After all, it was already paid for. 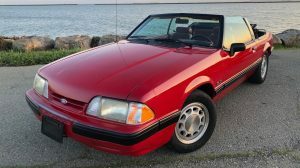 A $250 rust free parts car for you? Holy hell….if this were closer, it’d be home already. I am stopping by a salvage yard on Friday to pick up a good fender and see if they have any bodies they’re will to cut up. Great find! Wow, drop a LS1 in it and terrorize the streets. Good thing I’m not out west. Let me know if you find a fuel tank, my 1986 could use a new one too! Sorry, John, only need the door; but besides the radiator, I replaced the plastic front “chromed” grill(time consuming), the HAZARD switch, rebuilt the tabs to hold on the outer lower 16valve special plastic(VERY poorly designed and extremely time consuming). Many other minor parts have been replaced due to age/wear, but the car performed very well(before the “hit”). I will try to give Jeff some “heads-up” on some problem areas. Congrats Jeff! What a find – many long winter nights ahead of you on that thing, I imagine. Wish I could help get parts off that Phoenix-area car for you. I’ve roamed the yards here in Phoenix for the last 25 years. Jeff: I have a 1987 2.3-16(black pearl; original owner) that had a hit on the left rear door by one of our young “eyes-glued-to-the-cell-phone” ladies; her comment:”I didn’t even see you”????????? Anyway, I had replaced my radiator 2+ years ago, and even got a second one since the first one was so difficult to obtain. (still have the original which has a small crack in the top hose return outlet, which may be able to be fixed).